"In the fourth industrial revolution, ideas represent competitiveness. We must be allowed to embark on a challenge with only our ideas," the president said in a meeting with some 110 officials from local companies and lenders, including venture capitalists. "Finance must recognize the value of ideas. Finance must actively support and lead innovation," the president added. Thursday's meeting follows a series of recent events attended by the president where he strongly called for efforts to promote new businesses as a way of revitalizing the economy and creating more jobs. 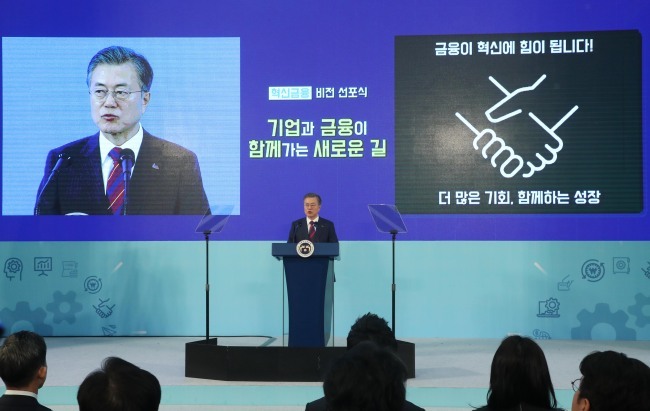 Moon's focus on the economy follows the apparent failure of his trademark job and income-led growth strategies, with the country's jobless rate reaching a 17-year high of 3.8 percent last year. "To create a second venture boom, we must have a financial system that promotes innovation and new challenges, in addition to efforts by businesses and the government," he said during the meeting held at the Seoul headquarters of the state-run Industrial Bank of Korea. "Already, many countries in the world are moving to promote innovative venture firms through innovative financing. Global leading financial firms are providing funds to innovative companies without any collateral based on their value and future growth potential," he added. "We, on the other hand, continue to prevent the launch of new innovative companies because of our collateral-based and profit-first lending practices," Moon said. 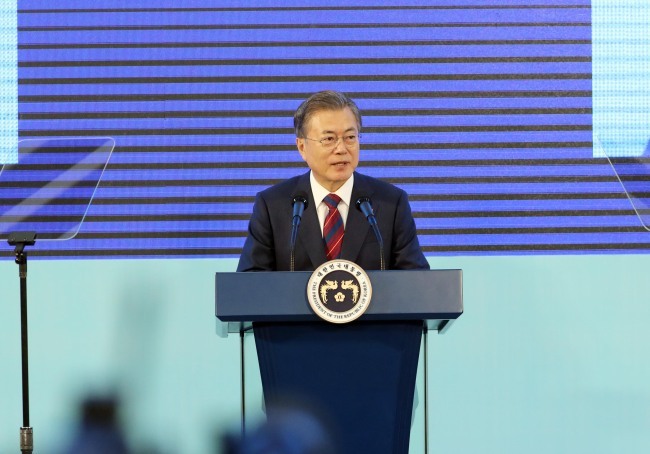 "First, it will completely innovate the bank lending system," the president said, adding the move will help funnel some 100 trillion won (US$88.8 billion) in fresh funds to small- and medium-sized companies over the next three years.